Posted on November 30, 2014	by Katy K.
This is the last book by a much-beloved author, finished posthumously by her sister. It includes a very touching note by that sister on how she did that – though it doesn’t say where Diana stopped and Ursula began! 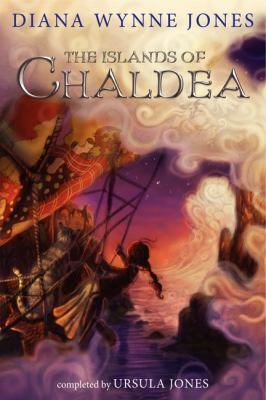 The Islands of Chaldea by Diana Wynne Jones. Completed by Ursula Jones. HarperCollins Children’s, 2014. In a small group of islands of Celtic-like culture, 12-year-old Aileen has just failed her Wise Woman initiation by not seeing a vision. She is devastated, but expects to just try again next full moon. Instead, she and her Aunt Beck are sent on a mission to bring down the magical barrier that separates the island of Logra from the other islands and rescue High King’s son, kidnapped with an entire hunting party many years earlier. Their party starts off including the King of Skarr’s second son, Prince Ivar, whom Aileen has decided to marry despite his arrogance, stupidity and complete lack of interest in her, and a Logran boy, Ogo, who was stranded when the barrier went up and has been a servant ever since. They will have to travel to the other islands to gather a representative from each, and it’s quickly apparent that somebody doesn’t want their mission to succeed, as the money bag they are given turns out to be full of stones. So there’s a quest, self-discovery and a magical cat. There is magic and betrayal and humor and a twist. Was it as great as DWJ’s classic Chrestomanci books, or Howl’s Moving Castle? I’d have to say probably not, but I still very much appreciated the opportunity for one more book from her, and I found it a nice satisfying story in its own right. It felt not too stressful to me, which probably means that people who like their books filled with Action would not be as pleased as I was. Fans of DWJ and of classic unappreciated girl comes into her own fantasy should enjoy it as well.